Current - Kelti and Orlando had a litter of lovely pups on the 24 March, 5 girls, 3 boy, 4 of the pups are rare hare pied. They will be going to their new homes 18-19th May 2019. Both parents have been FULLY HEALTH TESTED AND CLEAR PRIOR TO BREEDING. - MLS, NCCD, IGS AND LAFORA. Please always check this has been done if acquiring a beagle puppy from elsewhere. Looking for a Beagle Puppy? First and formost my beagles are my pets but as a pet behaviourist and trainer my priorities are for healthy well-tempered puppies who will make excellent family pets first but may also be ideal for training, sport or show dogs. Updates on the puppies will appear on a regular basis so if you are interested keep an eye on this page or the facebook page for photos and video's. The pups are homed reared, well socialised and habituated and will only go to approved forever homes. I am only too aware of the importance of the first few months of a puppy's life and the effect it has on them forever more, therefore, I will endeavour to do all I can to encourage the puppies to be as well adjusted as possible, in the aim to help them settle into thier new home with ease and to promote a happy, confident and calm adult dog. puppy pack - which contains, puppy food, collar, lead, bowl, food dispenser, Kong, tuff toy and travel crate. new families will also have the potential to attend a 2 hour puppy right start session, with some training and advice on toilet training, mouthing/biting, chewing, diet and general puppy behaviour. This is usually costs £70. there is also the opportunity to further purchase a house crate and bedding, etc, if you wish. I will aim to do some crate training before you get the puppy, hopefully making the transition easier and the puppy settling much quicker at your home. see facebook for the latest photo and videos of current and previous litters. What are beagles like to live with? They are fun loving, affectionate, sociable with people and other dogs, inquisitive and busy wee dogs. They generally make really great family pets and have a very low aggression tendencies in comparison to some other breeds. As an adult they require quite a bit of mental and physical stimulation to keep them occupied and out of mischief. They enjoy being the centre of attention and getting involved in anything and everything the family are doing. Beagles have been bred for centuries to hunt hares, rabbits, etc. Most lines today still have a strong hunting instinct and will happily follow a scent when the opportunity arises. Because of this, beagles do have a very independent nature, they don't need us to help them hunt, unlike working or gun dogs, they can manage it all on thier own! This doesn't mean they are difficult to train, or that they are stupid as some people say. In fact I would suggest the opposite, being very food motivated they are easy to train. I've seen this with both Pyper and Kelti and with many beagles going through my classes. Can you let them off lead? Some you can, some perhaps best not. I don't let mine off anywhere near roads or railway lines or generally in wooded areas. But can in 'safe area's', but I did work really hard on thier recall. From what I've heard most of the pups are the same. This is for the dog's safety not through choice. Due to not generally being safe off lead I feel its really important that all beagles have a safe and secure garden area, they are unsuitable for flats or apartments. Mine tend not to be vocal as some beagles can be, baying when hunting or to greet other dogs or if left home alone. Pyper is a good watch dog and will bark when someone comes into the home but is quickly too busy checking out their pockets or bags for goodies to be anything other than friendly. Kelti assumes everyone wants to talk to her, dogs and people. Don't opt for a beagle or make an inquiry if you don't have the time or inclination to be at least somewhat active or if you are not spending MOST of the day with them. Most of the beagle behavioural cases I have seen are because the dog is left on it's own most of the day so when bored and lonely they can create issues and become really stressed. 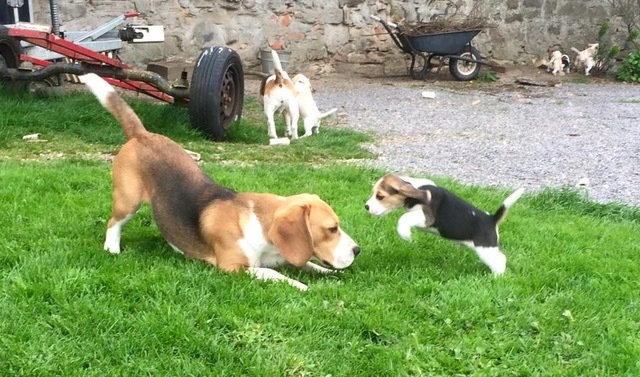 Unfortunately, due to poor breeding some beagles have health issues, which is why it's so important to only acquire a puppy from health tested and cleared parentage. See beagleheath.info for more details. If you would like to inquire about a puppy please complete the beagle questionnaire. the dam, mum to the pups (May, 2016 litter), breed here from Pyper's first litter. Kelti is a sweetheart, she is very affectionate, which is why I choose to keep her from Pyper's first litter. 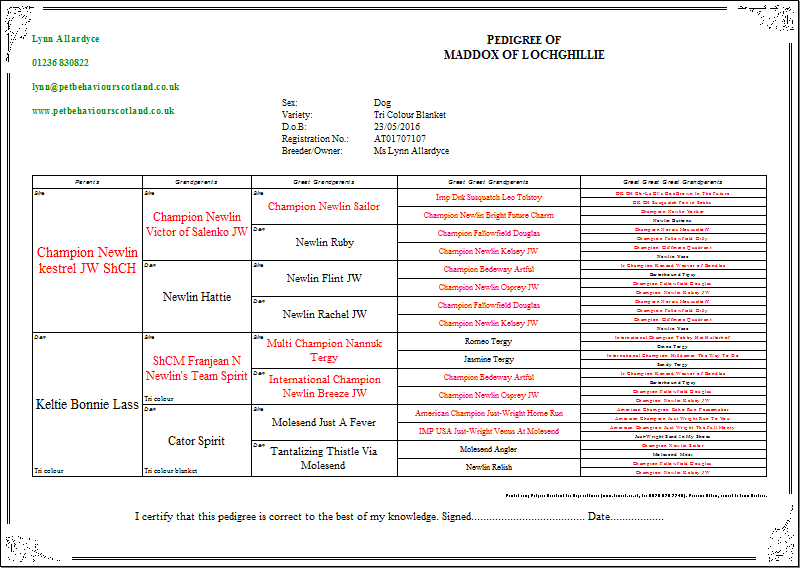 Like her dad, Spirit (Franjean N Newlin's Team Spirit), she is very athletic, see 2013 LITTER for his photo. She loves going for a walk with her mum Pyper, having a sniff and an explore. As a puppy she was rather clumsy and had fallen into the water several times, so began swimming at an early age, she's not as keen now! This is probably down to her enthusiasm. She loves to learn new things and gets really excited about it. She is very sociable and loves the company of others both other dogs and people. In fact, I would say Kelti's most favourite thing is to cuddle up on the couch. Beagles can be very vocal, neither Pyper or Kelti tend to be, though Pyper can bark a wee bit when happy to meet visitors. They tend not to bark or bay at other dogs when out or when left on their own. the dam, mum to the pups (Nov, 2013, May, 2015 and Sept, 2016 litters). Pyper is very sweet, good natured, fun loving wee girl. She is happy to go for a walk, explore and sniff, play fetch, play with family pets or do some training. She loves Rally O, fun agility and trick training. I have enjoyed training her and she seems really keen and happy to learn. She walks well on the lead and has a good recall, as long as she not on the scent of something! see videos below. She is very affectionate, loves to snuggle up with me on the sofa in the evening. 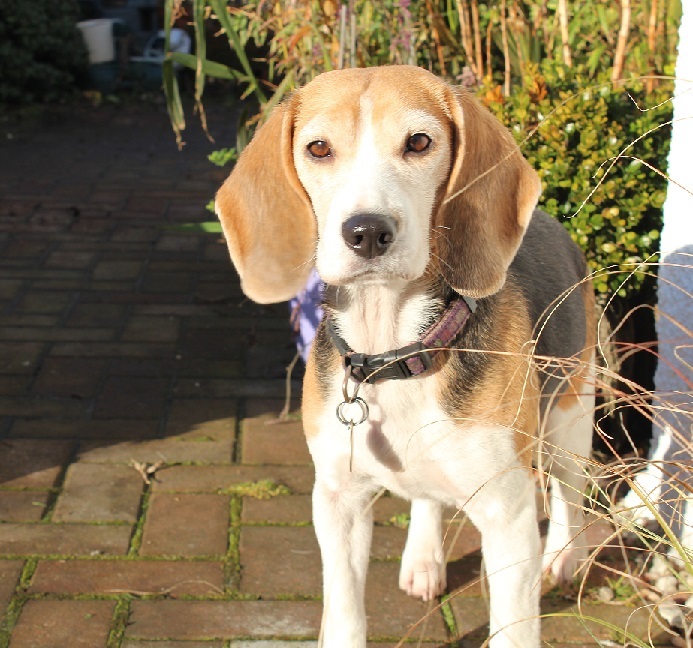 Pyper's dam came from Donna Gallant beagles, who works with Sam Goldberg, both the dam and her sire are from the 'Molesend line', which is owned by Sam, a veterinary Surgeon and the KC Health Coordinator for beagles in the UK. As I was considering breeding Pyper i was really pleased to find this health conscious line. From left Pyper, Hamish, Kelti, Ramzi and Indiana. Males and females always seem to look at things from opposite directions!! The pups were around 6 months at the time. I have used Molesend Orlando, one of Sam Goldberg's dogs. Orlando though not overly tall is well built and sturdy. Personality wise he is very sociable and loves to meet new people and dogs as well as bringing a toy 'prancing' when he meets you, loves playing tuggy and fetch. He is a confident dog, will happily play or go settle. He does love human contact and cuddles and is very gentle when playing with young puppies. 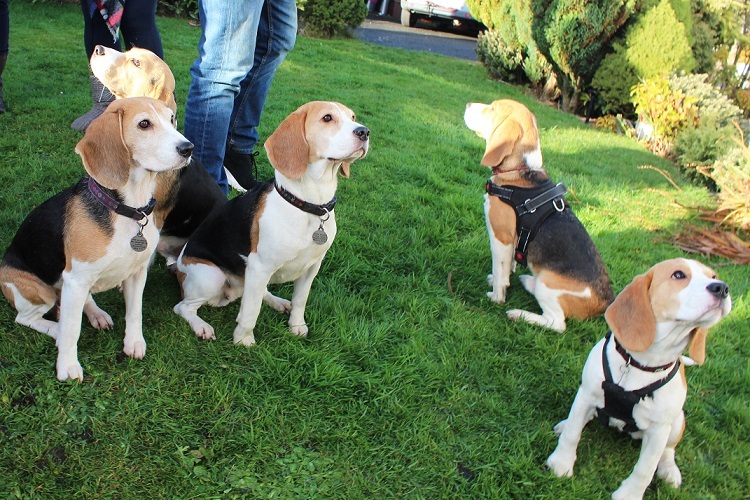 Also have a look at the 'Scottish Beagle Club site'. I would urge you also to check the 'Kennel Club'. 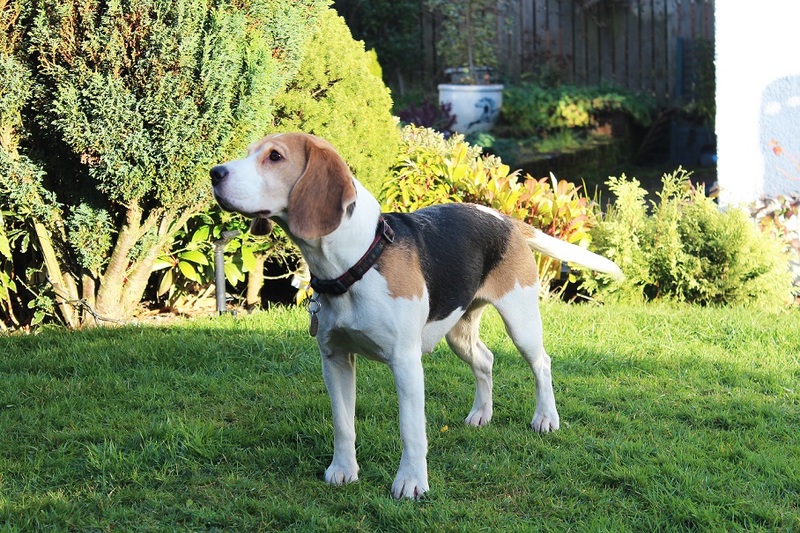 website for further health information, as well as 'Beagle Health'. Visit 'Contact us'. Page for more information and to get in touch.